The high value of personal possessions encouraged the use of protective cases of all shapes and sizes. These were moulded and stitched in leather, and were close-fitting and light-weight. They are exceptionally durable, and have often outlasted the contents. Integral loops allowed the lids to be secured with a cord or thong, by which smaller cases could be carried on a belt for convenience. They could be intricately decorated with fashionable ornament, personalised inscriptions and colour. This case was probably made for an ivory comb. With the lid removed, the comb could have been easily grasped along its handle, by virtue of the cutaway area at the mouth of the case. The inscription DE BOEN AMORE (With good love), and floral imagery make explicit the nature of the gift. A comb was considered an appropriate love gift from the lover to his beloved at a betrothal. 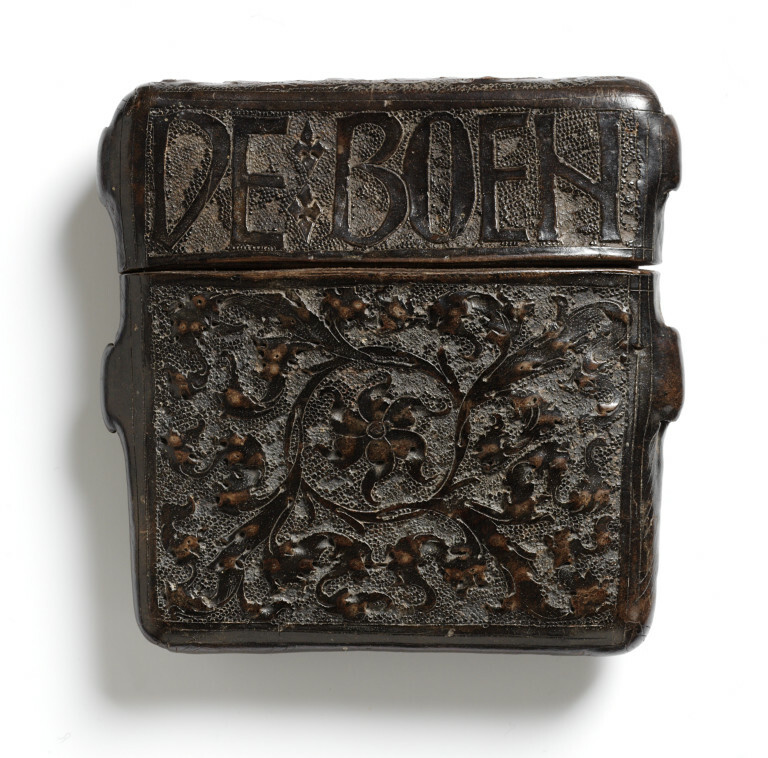 Rectangular case and lid, consisting of a liner of two thicknessess of leather, stitched, and an outer also of two layers of stitched leather; and a lid also of stitched leather. With two loops on the body corresponding to two on the lid for a thong (missing). 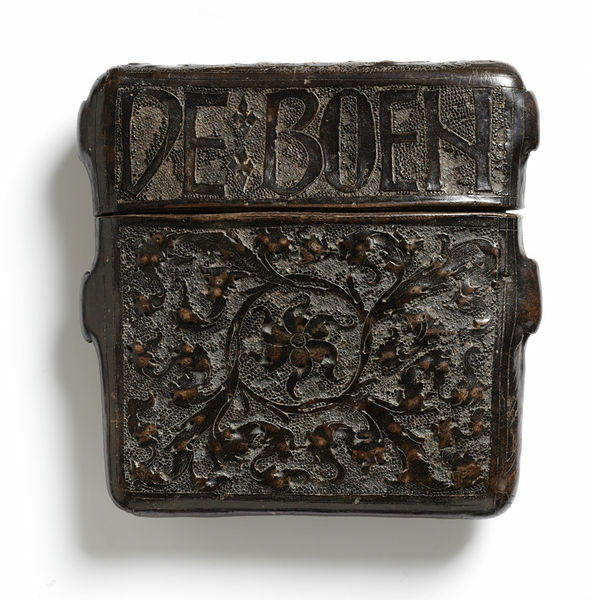 The lid worked with the inscription DE BOEN [on one side] AMORE [on the other], and a foliate design on the upper surface of the lid. The body of the case with a rectangular panel on each side with foliage branching from a central sunburst on a granular ground, and a lattice design under the base. On the outside pale areas possibly of a pigment, but probably indicative of wear. With a pasted, printed label on the inner part of the body (usually covered by the lid) '11'. Bought from Stefano Bardini with other objects (9 to 45-1891) for £2450 1s 11. The early suggestion that this case was made for an ivory comb seems convincing, given the usual dimensions of 15th century combs, and the cutaway area at the neck, useful for grasping the comb handle, whichever way round it had been inserted. The inscription, floral imagery (and sunburst, like the warmth of a lover's gaze?) reinforce the idea of it being for a love gift, and it is clear that combs were especially appropriate in this regard (see Camille, below). The early suggestion that this case was made for a comb seems convincing, given the typical dimensions of ivory combs in the 15th century. With the lid removed, the comb could have been easily grasped along its handle, by virtue of the cutaway area at the mouth of the case. Valuable property such as an ivory comb would have required a protective case, convenient at home, as well as when travelling. As combs were appropriate love gifts (see Camille, below), the inscription, along with floral and sunburst imagery reinforces the comb thesis. A French royal account of 1316 describes four items bought for the royal family from Jean le Scelleur for 74 shillings: "1 mirror, 1 comb, 1 gravoir [for parting the hair], and 1 leather case"
Stitching is the most common technique, with holes made in leather by awls. Thread is made from flax or hemp yarn rolled with beeswax. The other principal assembly technique is sticking to a wooden structure. The traditional adhesive for box covering is hot animal glue, which was often created as a by-product of the fleshings taken by the tanner from the skins or hides. Leather objects can also be created by moulding. The traditional medieval term was cuir bouilli, though Waterer suggests that boiling could not have been used. The technique is quite simple, and consists of soaking the (vegetable-tanned) leather in cold water until it is thoroughly saturated. The leather is then very plastic and can be modelled over formers in moulds of plaster, wood or metal. If the surface is to be ornamented by tooling, stamping or punching, this must be done while the leather is damp.The leather is then dried gradually (to avoid brittleness), supported by its mould or filling which can be removed later. Punching to give a texture to the background of incised designs, using a variety of small iron or bronze punches (also used in book binding). Embossing, performed with a ball tool from the flesh side of leather that has been previously dampened. Finally the object is decorated with coloured dyes, usually with some paint (tempera). Red seems a common colour (little work on medieval dyes). Some leather was gilded using glaire (white of an egg) or gold size to attach gold leaf which adhered under the heat and pressure of book-binding tools. However, Davies argues that the multiple techniques of cuir bouilli have never actually been very clearly established. Cuir bouilli differs from other supported leathers in that after treatment it is rigid (without a support) and water resistant, indicating that the structure of the leather has been altered through a chemical reaction. Otherwise leather would remain flexible unless coated with a stiffening medium or mounted on a backing material. She suggests that all true cuir bouilli was made by taking vegetable-tanned leather and saturating it with water, then heating it to a temperature just before it starts to shrink, removing it from the hot water and moulding it immediately, and if necessary stitching it while wet. In this way the molecular bonding of the leather is weakened but not fully released allowing limited realignment of its molecular structure to take place in a more controlled manner. Alternatively, if the heat source application is limited to only the surface of the wet leather then it is possible that the shrinkage solely occurs in the outer layer of the leather, producing a surface hardening effect and reinforcing the structure. She speculates that by impregnating oils, resins and waxes, it may be possible to mould the structure of the leather when hot, and to produce more detailed surface decoration because otherwise this decoration would be distorted by shrinkage after tooling.